If you want to catch the KTM train from Butterworth to Singapore Woodlands Railway Station, from the 19th May 2016 and the introduction of a new KTM timetable, this journey will involve three trains. This is due to the fact that all long distance Intercity Trains are cancelled from this date. With the new timetable, only high-speed Electric Train Services (ETS) are now operating long distance services on the new dual tracks that currently stop in Gemas. From JB Sentral you can then either cross the Causeway into Singapore by train or bus. The Shuttle Train takes just five minutes to get to Woodlands Station in Singapore. If you are staying on Penang Island there is no need to go over to Butterworth Station on the mainland to buy your train tickets, as there is a small KTM booking office located at the jetty in George Town, close by to the Penang Ferry over to Butterworth. The office can be easily found by just walking towards the the ferry departure gates. As you walk along the pathway up to the ferry, just as the path turns left, you will see the office on your right hand side. 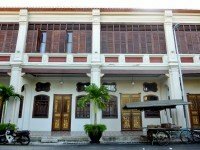 The KTM office in George Town is open every day, except Sunday, from 09.00 until 16.00, but closes for lunch for an hour (at various times). 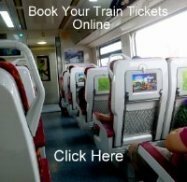 An even easier way to buy tickets is to book them online directly from Malaysian Railway or a by using an online booking agent. If you do not want to do the trip in one go, there are many places of interest that you may want to stop at for a day or two along Malaysia's North to South Railway Line. These include, Taiping, Ipoh, Kuala Kangsar, the Cameron Highlands and Melaka (Malacca). See our Butterworth trains page for more places to visit on your trip south to Singapore.